"I grew up in the Solomon Islands and Fiji and over the past 10 years have lived and worked in the Solomon Islands, running various projects to support women into financial independence. Earlier this year I met the “Kaleko SteiFree” team, a small women’s business that produce re-usable sanitary pads and provide education on menstrual hygiene management, an important yet often unrecognised issueI. For many girls and women in the Solomon Islands there is limited access to basic sanitary products, there is no choice by to use toilet paper, cloth or local natural materials such as leaves or coconut husks. These challenges have the potential to negatively impact physical and emotional health, their participation in school and work and their contribution in the community. I was inspired by the work of Kaleko SteiFree and offered to help spread their message and product to more girls and women, especially those in rural communities. One way I have done this is through my work with the Loloma Foundation. Since 2016 I have volunteered with the Loloma Foundation on medical outreach missions to rural communities in Fiji and the Solomon Islands. From August 15th-22nd this year I am volunteering with the Loloma Foundation on a medical outreach mission to rural communities in the Solomon Islands. The women’s health team will distribute re-usable sanitary pads and provide basic medical care and education on women’s health related issues including menstrual hygiene management. With only 4 days left to go on my campaign, AUD AUD 5,385 has already been raised which will be used to purchase 200 kits from Kaleko SteiFree. These are the kits we will distribute during the Loloma Foundation mission in August. 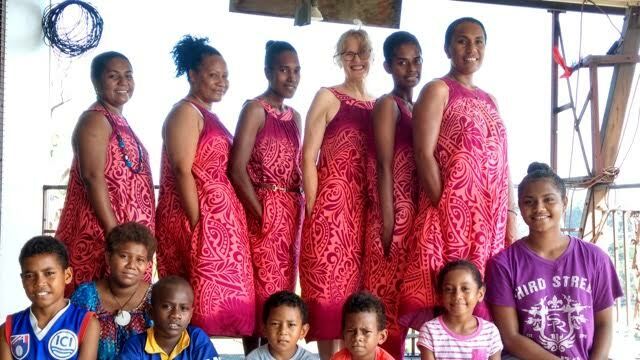 An additional 200 re-usable sanitary pads have been produced and donated by the International Tea Group, a group of friends who volunteer in charity projects in the Solomon Islands. This has been an incredible effort by so many people near and far. I am truly grateful for the support and know that this will make such a positive difference to the lives of many girls and women in the Solomon Islands. There is real power in coming together to do good. I am already planning how I can do something similar in Fiji next year! "